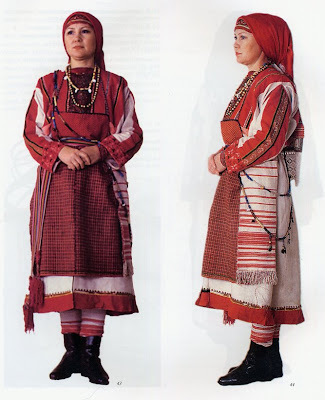 Hello again, Today I will continue the series on the costumes of the Volga peoples. This posting will describe the costume of the Northern Udmurts. 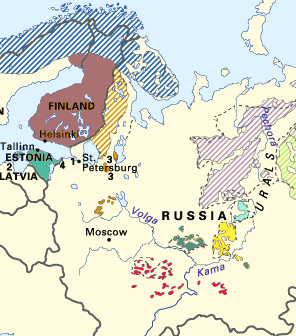 The Udmurt are shown in the golden yellow color on this map. In older documents they are referred to as the Votyak. During Soviet times it was decided to refer to [most] indigenous peoples by their self-designation, which, by the way, Americans still do not do. The Udmurt have an Autonomous Republic in the Russian Federation, the capitol is Izhevsk, and this is their flag. 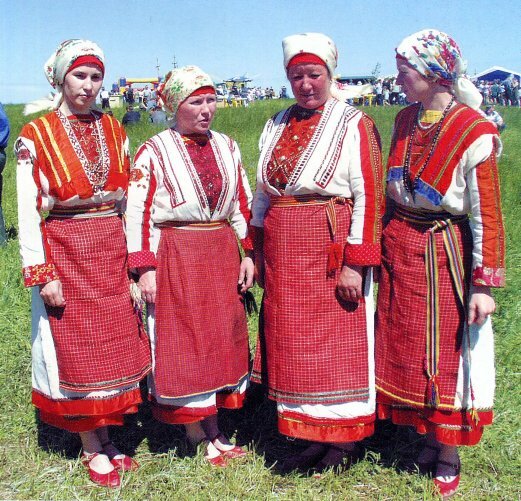 Here are some women wearing one version of the north Udmurt costume. 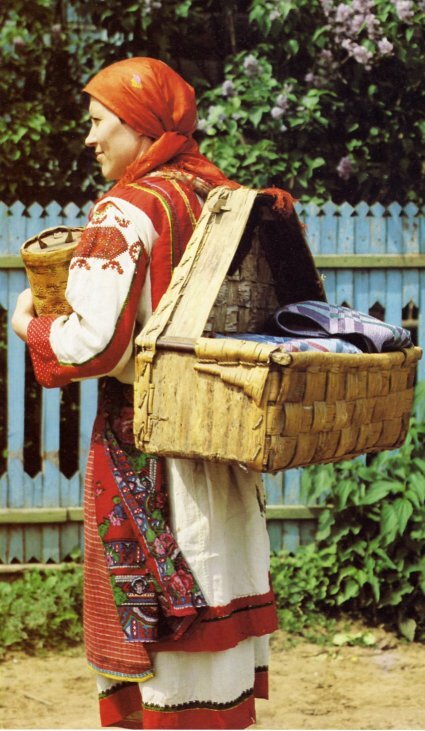 The southern Udmurt costume is quite different, and will have to wait for another post. You will notice that the costumes i am covering in this series form a coherent group. 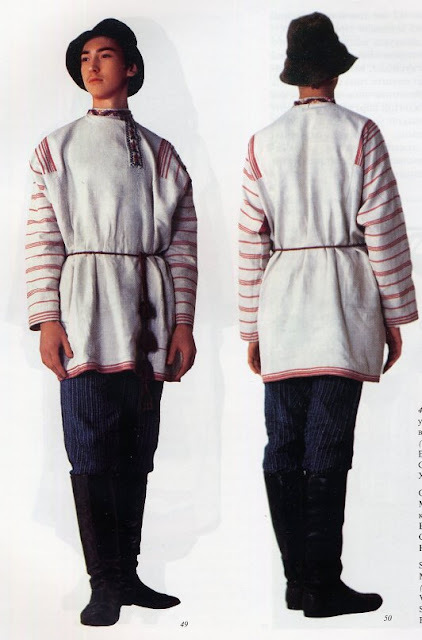 The basic garment of the north Udmurt costume is, as usual, the chemise, of which nothing shows when the entire costume is worn, except the sleeves, and often the lower hem. 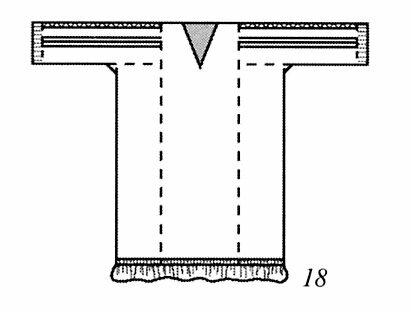 The cut of the chemise is very typical. You will notice the appliqued strips of red cloth, which is quite popular in this costume and also among the neighboring Chuvash. A glance at the above photo will show that the embroidery of the sleeve has two possibilities. 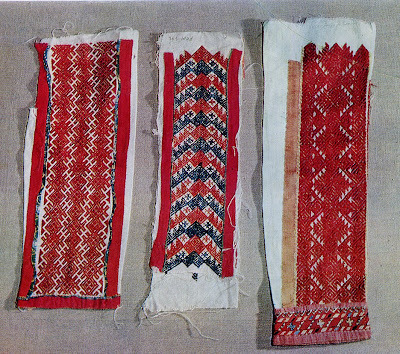 The women on the right show the first, a lengthwise strip, nowadays is narrow and flanked by red applique strips, formerly the strips of embroidery were wider, as seen below. The two women on the left show the other possible way of embroidering the chemise, with a small crosswise design high on the arm. 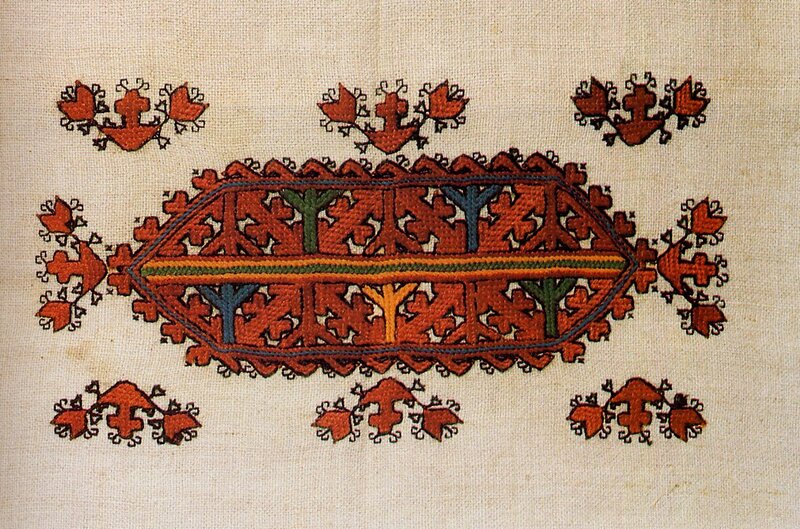 Here is a closeup of one such piece of embroidery. of a museum in Hamburg, but they did not have any of the rest of the costume. In fact, the kaftan is never worn in this way. The arms are always put through the slit in the upper sleeve so that the sleeve of the chemise is visible, as in the above photograph. The sleeves of the kaftan hang down behind, and are often cut short, so they do not fall below the elbow. The hem of the kaftan is usually somewhat shorter than that of the chemise, as seen in the photo above. Here is shown the cut of the kaftan. There are ornamental strips of embroidery and/or applique on the upper part of the garment, as in the drawing on the right. 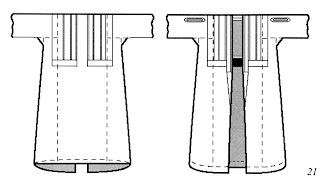 Occasionally on particularly festive garments, the strips continue to the bottom edge as in the drawing by Max Tilke. 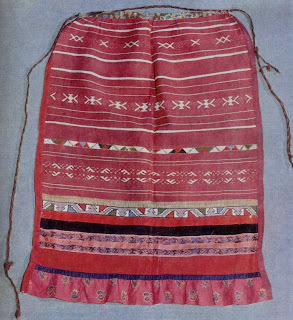 Over the chemise and under the kaftan, there is worn a rectangular breastpiece, or dickey, which is tied with string around the neck, this garment in Udmurt is called kabachi. it is always heavily embroidered, and completely covers the front of the chemise. As you can see, each of the four women above has a different design on her kabachi. Here is a closeup of one. This is the major focus for the embroidery of the women of northern Udmurtia. Again you can see the outline stitch filled in with slant stitch. The bottom has designs executed in darning stitch. I will have to publish another posting showing some of the diversity of the embroidery of this garment. 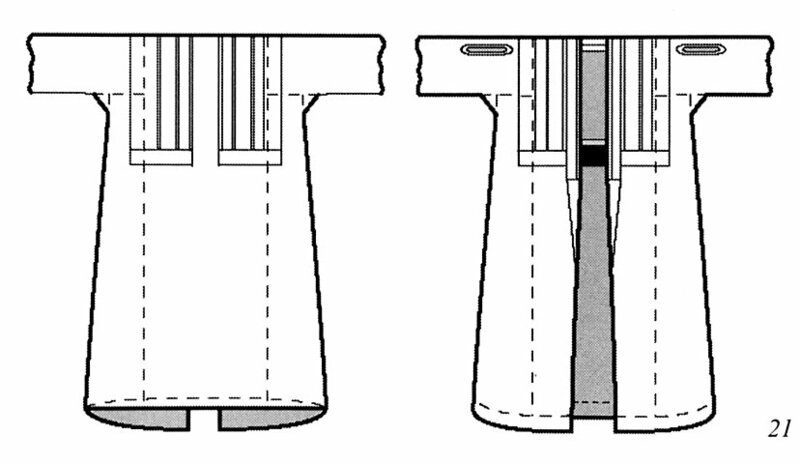 The kaftan is held closed by an apron tied over it. 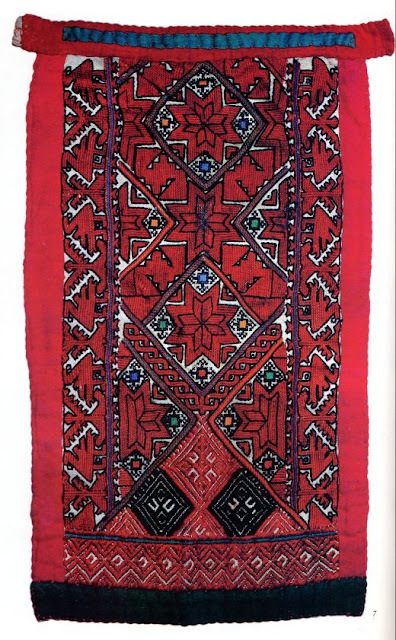 Some of the older ones were made of material with ornamental stripes woven into them,. sometimes with additional embroidery in between to supplement the design. here below is one such specimen. Otherwise the apron is made of cloth woven with a small plaid, with the primary color being red. Sometimes the apron has a small removable bib, as shown on the photo of the woman below on the left. The costume is finished with strings of beads, a decorative cloth folded and worn on one or both hips, and a woven sash. See the two photos below. The man's costume consists of a shirt with the opening on the side, the older ones seem to have it on the right side, in the old Persian style, and the newer ones have it on the left, as in Russian shirts. 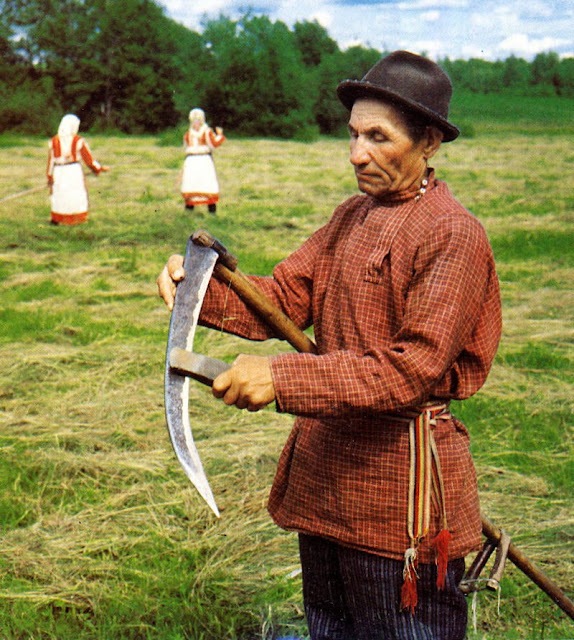 Although, noone knows why the Russian Shirts open on the left, none of the other Slavic peoples do that. It is possible that the Russians took it from the Finnic Peoples, as they have certainly assimilated several. The man's shirt was made of material woven in stripes, as shown here, sometimes with embroidery on the collar and opening placket. Otherwise it was made of the same kind of plaid as in the women's apron shown above, as you can see from the bottom photo. The mens costume was finished off with a sash, dark striped trousers, and either boots or footcloths and shoes woven of birchbark, as in the Mari. Thank you very much for visiting my blog, and as always i welcome your comments and any suggestions of specific costumes or folk embroideries to research and write about. ﻿Source Material: Recently there seems to have been quite a bit of material published in Izhevsk on this topic. I check your blog daily for new postings. Very interesting and informative. Thank you very much, I enjoy doing the research and putting them together. I took a peek at your blog and im impressed by your creativity.